If you have an Easter party in your future (one of the things I will miss the most about preschool!) these Easter basket cookies are an adorable and easier than you would imagine treat that kids will L-O-V-E! 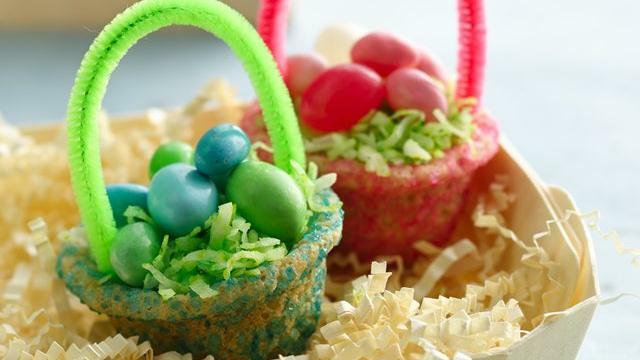 You use refrigerator cookie dough rolled in colorful sprinkles to create the baskets and then just fill them with a little coconut 'Easter grass' and some Easter egg shaped candies. Cute, easy, and yummy. The trifecta of holiday treats. If you want to overdo the sugar, these would make DARN cute cupcake toppers too! You can get the full recipe for these Easter basket cookies over at Pillsbury. And just a reminder you can check out all of the fun Easter ideas in my archives from Easters past!